Goddess of Wealth. 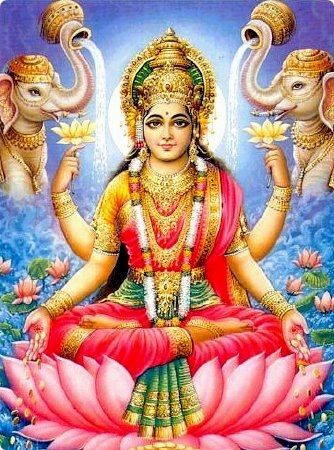 The money from her front hands, the two golden lotus flowers in her two other hands, and the elephants that keep pouring water, symbolise plenty. These articles contain extracts from Hinduism: Its Meaning for the Liberation of the Spirit - a treatise by Swami Nikhilananda (1895-1973). The book deals with the Hindu faith from a practical religious point of view, and contains some of the swami's reflections. Nikhilananda was born Dinesh Chandra Das Gupta. After graduating from the University of Calcutta, he first entered journalism, and then joined the Indian freedom movement. He was put away in an English prison camp for some time too. He was later initiated in yoga by Ramakrishna's widow, Sarada Devi, and met many direct disciples of Ramakrishna too. They encouraged him to study Hindu scriptures, which he did. In due time he founded the Ramakrishna-Vivekananda Center of New York and headed it until he died in 1973. Nikhilananda lectured at universities, churches, and synagogues. His most important works include translations of The Upanishads, The Bhagavad Gita, biographies of Holy Mother (Sarada Devi), and Swami Vivekananda. The swami also translated The Gospel of Sri Ramakrishna into English. The Gospel was voted as one of the ◦"100 Most Important Spiritual Books of the 20th Century" by the American scholars convened by Philip Zaleski and HarperCollins publishers. Nikhilananda's compilation of the works of Swami Vivekananda under the title of Vivekananda: The Yogas and Other Works is an astounding work too. Another swami book to mention is Man in Search of Immortality. Besides he published many articles. Many of the works of Swami Nikhilananda are translated into various European and Indian languages. They are recognized as authoritative, interpretive texts on Vedanta. I give you some extracts from his Hinduism below, chapter after chapter. Page references are put in brackets, so you may find and reflect on these keynotes in the Swami's wider context if you will. That could be helpful to some. Hopefully, the culled extracts clarify central parts of what Hinduism is. In the Bhagavad Gita humans are divided into four groups, determined by their actions and virtues [including capabilities]. When the priest (brahmin) rules, there is a tremendous exclusiveness on hereditary grounds – the persons of the priests and their descendants are hemmed in with all sorts of safeguards – none but they have any knowledge . . . Priests cultivate the mind, for through the mind they govern." The commercial (vaisya) rule is marked by blood-sucking power. By their reign, culture begins to decay. The labour (sudra) rule will try to distribute physical comforts – There will be a great distribution of ordinary education, but extraordinary geniuses will be less and less. . . . Now is the time for the last – they must have it – none can resist it . . . Let this one be tried – if for nothing else, for the novelty of the thing. Speak the truth. Practice dharma. Do not neglect the study [of the Vedas]. Having brought to the teacher the gift desired by him, [enter the householder's life and see that] the line of progeny is not cut off. Do not swerve from the truth. Do not swerve from dharma. Do not neglect [personal] welfare. Do not neglect prosperity. Do not neglect the study and teaching of the Vedas. Do not neglect your duties to the gods and the Manes [forebears]. Treat your mother as God. Treat your father as God. Treat your teacher as God. Treat your guest as God. Whatever deeds are faultless, these are to be performed – not others. Whatever good works have been performed by us, those should be performed by you – not others. Those brahmins who are superior to us – you should comfort them by giving them seats. Now, if there arises in your mind any doubt concerning any act, or any doubt concerning conduct, you should conduct yourself in such matters as brahmins would conduct themselves – brahmins who are competent to judge, who [of their own accord] are devoted [to good deeds] and are not urged [to their performance] by others, and who are not too severe, but are lovers of dharma. With marriage, a person enters the second stage. A normal person requires a mate; his biological and emotional urges in this respect are legitimate. Debarred from marriage are those rare souls who "forsake the world" [drop out of society, more or less] at the call of the spirit. Gupta, Mahendranath. The Gospel of Sri Ramakrishna. Tr. Swami Nikhilananda. New York: Ramakrishna-Vivekananda Center, 1942. Himalayan Academy. What Is Hinduism? Modern Adventures into a Profound Global Faith. Kapaa, HI: Himalayan Academy, 2007. Klostermaier, Klaus K. Hinduism: A Beginner's Guide. Oxford: Oneworld/Beginners Guide, 2008. Klostermaier, Klaus K. A Survey of Hinduism. 3rd ed. Albany, NY: State University of New York Press, 2007. – 700 pages. Nikhilananda, Swami, tr. Vivekananda. The Yogas and Other Works. Rev. ed. New York: Ramakrishna-Vivekananda Center, 1953. Nikhilananda, Swami, tr. The Upanishads. Abridged ed. New York: Harper/Cloister, 1964. Nikhilananda, Swami. Hinduism: Its Meaning for the Liberation of the Spirit. Madras: Ramakrishna Math, 1968. Nikhilananda, Swami. Man in Search of Immortality. London: Allen and Unwin, 1968. Nikhilananda, Swami, tr. Drg-Drsya-Viveka. An Inquiry into the Nature of the "Seer" and the "Seen". 5th ed. Mysore: Ramakrishna Math, 1970. Nikhilananda, Swami, tr. The Gospel of Ramakrishna. Abridged ed. New York: Ramakrishna-Vivekananda Center, 1974. Nikhilananda, Swami, tr. Vedantasara or the Essence of Vedanta. 6th ed. Calcutta: Advaita, 1974. Nikhilananda, Swami. The Upanishads, Vols 1-4. New York: Ramakrishna, 1977.